This recipe is great to serve your over-night guests when you want to impress them with something delicious and decadent. Pumpkin Cobbler French Toast Casserole is made the night before. In the morning while it bakes, you’ll have time to fry up some bacon, slice a few oranges, warm some maple syrup and brew coffee. In about an hour, you’ll have a wonderful breakfast your guests are going to love. They may not want to leave! 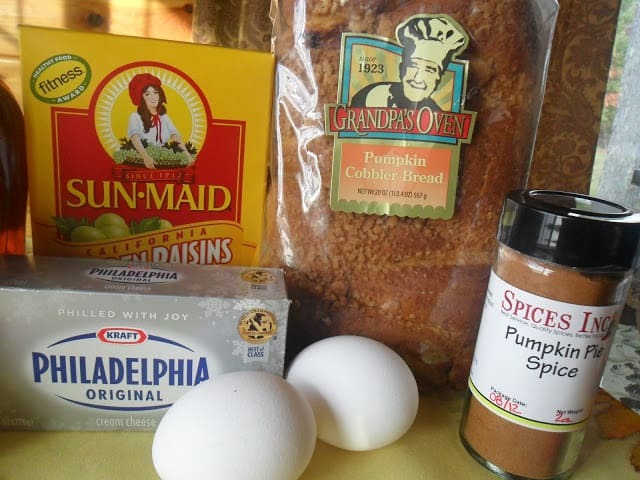 For this recipe I used Pumpkin Cobbler Bread by Grandpa’s Oven. Both apple fritter bread and cinnamon swirl bread are excellent substitutes for this casserole, if pumpkin cobbler bread isn’t available. Grandpa’s Oven Breads can be purchased at Walmart. You can substitute any brand of raisin bread, cinnamon swirl bread or apple fritter bread. You can use homemade raisin bread or apple fritter bread to make this casserole too. Chocolate Chip Panettone French Toast Bake is another great overnight breakfast bake. It’s perfect to serve overnight family or friends. Invite your family over for brunch before you head out the door to spend a day shopping. French toast bakes or breakfast casseroles are super delicious, easy and can be made the night before. In the morning, set the casserole out for 30 minutes. Bake then serve with fresh fruit, juice, coffee and maple syrup. A delicious breakfast casserole everyone will love. The casserole needs to be made the night before baking. Place bread in a greased 2 quart baking dish; press down gently. Sprinkle golden raisins over cubed bread. In a small bowl, beat the cream cheese until fluffy. Gradually beat in warm whipping cream and maple syrup; mix well. Whisk together eggs, vanilla, pumpkin pie spice and salt; add to cream cheese mixture. Whisk together. Pour evenly over the bread; lightly press egg mixture into bread with spatula. Cover; refrigerate for 8 hours or overnight. Remove baking dish from the refrigerator 30 minutes before baking. Bake, covered at 375 for 25 minutes. Uncover; bake 20 to 25 minutes longer or until center is set and the top is golden brown. Pumpkin Cobbler Bread Walmart. *Note: This is not a sponsored post. Pumpkin and french toast…a combination of two of my favorites. Thanks for sharing on Saturday Dishes. I hope you'll return next week when we feature Spring Desserts.